In any organisation, no matter how large or small, it is inevitable that problems will occasionally arise with the performance of a single staff member. Problems of this kind can have a multitude of possible causes, only some of which can be considered purely in terms of behaviour. 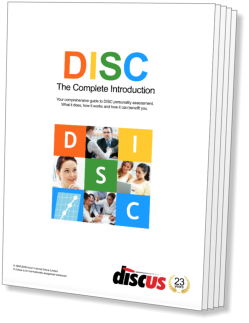 Where the problem is rooted in a question of behavioural styles, however, DISC can help to isolate it and possibly suggest some solutions. There are two main problem areas of this kind that are related to behavioural questions. The first of these is 'role conflict', where an individual's work or attitude seems to be inadequate because they are not temperamentally suited to the type of work they are involved in. The second is 'behavioural conflict' where the problem arises not from an incompatibility with the role itself, but with one or other members of the individual's team or group of work colleagues. We shall treat each of these situations in turn. The 'Internal' and 'External' Profiles both match closely against the Job Profile. This indicates that role conflict, at least as far as the behaviour is concerned, is unlikely to be a cause of the difficulties being experienced. The Internal Profile matches the Job Profile closely, but the External Profile does not. This would suggest that the person concerned misunderstands the requirements of their position. By checking the shifts in style (see Changes Across a Series), it is possible to see exactly which areas are the source of a particular problem. Neither the Internal or External Profile match the Job Profile. This final scenario indicates that not only is a candidate unsuitable in terms of behaviour for their role, but also that they feel unable to adapt themselves to the demands of their situation. In all these cases, remember that the picture presented by DISC can only describe the condition of a person's behaviour, and is unable to address specific events. Current problems with the behaviour may have their roots in outside factors, and these should be explored before making a final decision. Certain types are simply not suited to working in tandem. A brief examination of strong and weak combinations of types is given in the Suitability Comparison section of Chapter II. Situations in which problems are rooted in Behavioural Conflict often manifest themselves as unusual shifts in a person's External Profile. If you have DISC results from regular assessments of the individual concerned, it can be enlightening to examine them for any changes in the External pattern. Shifts downwards in Dominance or Influence are often particularly indicative of this type of effect. As with Role Conflict, it is important to point out that behavioural effects may represent the results, rather than the cause, of any dispute or disagreement. If Behavioural Conflict arises because of an argument about a specific matter, for example, DISC will have no way of detecting this. Clearly, such situations will require careful handling if they are to be resolved effectively.